This Shoot was shot in the Historic Downtown area of Charleston, South Carolina. The Wedding Venue The Cedar Room was used for the inside shots. The Cedar Room at Mercantile and Mash, located in the celebrated Cigar Factory is an open and airy space, featuring historic wood columns, hardwood floors and original elements of the circa 1881 building. The cedar Room also has an adorable Bridal Suite On Location which we have worked in before! The amazing Vendor Team that came together for this shoot Were Charleston Wedding Florist Lori from We are Petoloso. A Boutique Floral Design Company that Thrives on creativity. Planning for this shoot goes to Charleston Wedding planner Stacia Baskins that owns Paper Swallow Events. As for the Bright and Airy Wedding Images we got back came from Destination Wedding Photographer Tara Whittaker. 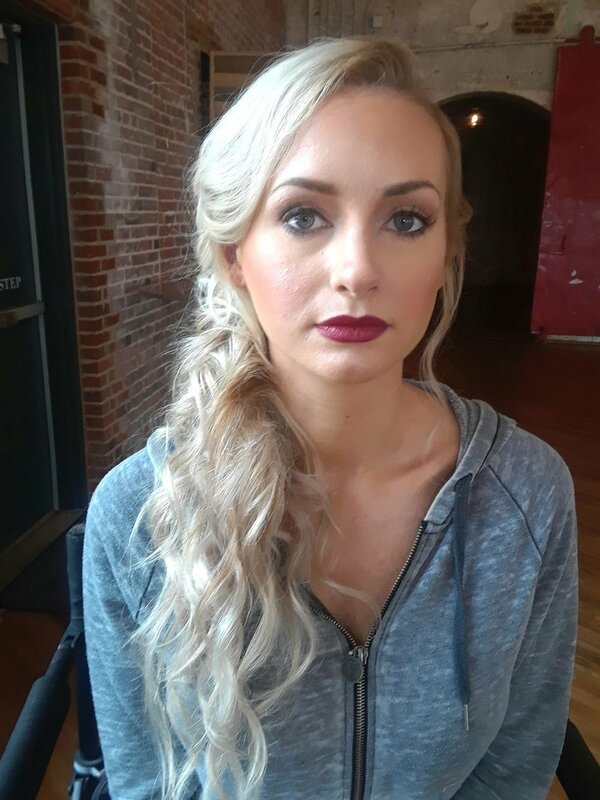 The Hair & Makeup Look that we did on our Model Lindsey O was a Classic Southern Bride with a hint of Sass! For her Foundation we used Traditional Makeup applied with a brush. We then sat her Makeup with a Press powder and added a little bit of warmth around her Hairline . We gave this Beauty a set of our Famous Lash Clusters and decided to go with a Classis Red Lip. Since Lindsey’s has Blonde Hair we are able to see all of the Detail She has in her Trendy Pony. If your Hair is more on the Darker side you will see be able to see the detail they just wont pop as much. The Wedding Gown that she is wearing has a sweetheart neckline so this style was perfect to show off her dress.